By Scott Isaacs, M.D., Frederick Vagnini, M.D. Scott Isaacs, M.D., Frederick Vagnini, M.D. Do You Understand the Risks of Metabolic Syndrome? If you’re an adult in America, there’s a 27 percent chance you have metabolic syndrome. Even though it affects 55 million people in the United States, you may not have heard of this syndrome much less understand it. It is actually a group of metabolic disorders—obesity, insulin resistance, abnormal cholesterol levels, and high blood pressure. While each of these problems can lead to cardiovascular disease, stroke, and diabetes, the collective effect of metabolic syndrome significantly increases the risk of death from these diseases. What is insulin resistance? Why is it such a critical issue? 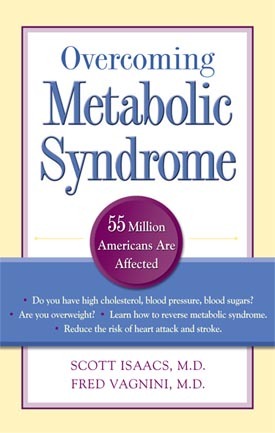 How do you overcome metabolic syndrome? How important is weight loss? Which medications are used to treat the syndrome?